I am writing to you on behalf of one of your youngest constituents. 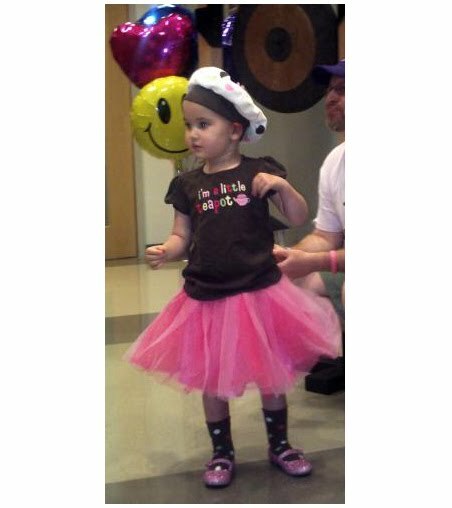 On January 20, 2009, as President Obama was taking the oath of office, my 3 year old daughter, Charlotte Jennie, was in the hospital receiving the diagnosis of a brain tumor. The tumor was pervasive in her brain and judged to be about the size of a large orange. Within 2 weeks, she had undergone two craniotomies to remove as much of the malignancy as the surgeons could safely take. After 3 weeks in the hospital, Charlotte is fortunately home and progressing well with the physical and occupational therapy that was needed due to the effects of both the tumor and the surgeries on her motor skills. Now we are in the process of removing the rest of the cancerous cells with chemotherapy. Through all of this, my husband and I actually feel relatively blessed. We have a wonderful social support system surrounding us. Our friends and family have showered us with hugs, gifts, meals, and prayers. The doctors tell us that Charlotte’s prognosis is good even though we know the road ahead of us will be long. We feel extremely lucky to live close enough to Richmond to receive the best care possible at a hospital such as the Medical College of Virginia (MCV) and we are constantly amazed by the skill and technology available to the physicians and other health care workers who heal our daughter on a daily basis. The proximity to the hospital has enabled my husband and I to continue working (albeit in a more limited capacity). This is especially important because we are both self-employed and are struggling as many businesses are right now to keep our household as well as our business afloat in the current economic climate.As small business owners, we had purchased individual insurance to cover our entire family. Since we are all relatively healthy, we opted for a high deductible plan that would provide for regular wellness but sufficiently covers our needs in a case such as this. Until last week, we felt very comfortable with everything our insurance would provide. We had not met with any denials for care or logistical hurdles. We had discussed plans for Charlotte’s care with her doctors and they had drafted out a road map of chemotherapy, possible radiation, and stem cell transplants that would take from 6-12 months. Her first round of chemotherapy is scheduled to begin March 5.Imagine my surprise when I received a call from the insurance company telling me that while my daughter’s main health care needs could be met at MCV, the stem cell collection and transplant services that she will require throughout this process would need to be handled at a different hospital because MCV was not considered to be “in-network” for our insurance. In fact, the closest hospital for this service is at Duke in North Carolina, a four-hour drive from our home. Because of this, in the midst of my daughter’s chemotherapy treatments, we will now somehow have to coordinate care between MCV and Duke. We will need to uproot my daughter and at least one of us (myself or my husband) to travel miles away from our home in order to harvest her stem cells (three times, after each initial chemotherapy treatment) and then somehow coordinate her transplants during the three high-dose chemotherapy treatments she will need to receive down the line. We will need to get to know a new set of doctors who will need to coordinate treatment with the MCV team and make sure that everything stays consistent for our daughter’s care. All the while, MCV has the staff, knowledge and ability to provide this level of care and services for my daughter. They are simply not “allowed” to because MCV is not considered a part of their “network”. We plan to do whatever we can to fight this decision made by the insurance company. We plan to discuss this situation with MCV and see if they are willing to negotiate with the insurance company so that our daughter’s care can stay in her hometown. My question to you is why should this even be an issue? At the moment, all of our energy is running towards the care of our daughter. I do not have the time to negotiate with insurance companies. I do not have the energy to fight more than my daughter’s cancer. As President Obama and Congress begin to tackle the many issues surrounding the health care system in our country, I would like for you to consider our family’s story as one example of how the insurance companies have taken control of health care when the control should be given to the hospitals who hire physicians with the training and expertise to know what is best for their patients. We would like you to also consider those families who have not been nearly as lucky as ours. We know another Hanover County family whose beautiful six-year old daughter (Reese) began her fight with a brain tumor only two weeks before Charlotte’s. The Klauer family has been met with denials from their insurance company over the physician’s recommended protocols. They have been forced into “battle” with the insurance companies to get the best care for their daughter.Finally, please consider the many families we have met while at MCV whose stories are far from blessed. We saw children who were alone in the hospital on a daily basis because their parents had to choose between keeping their job and staying with their sick child. We met families who had no choice but to wait until their children got “sick enough” to come to the emergency room because they had no insurance for wellness care. Through this process, I have realized that within our current insurance system, my daughter will need to constantly remain insured in some way for the rest of her life because of what will now be considered a “pre-existing condition”. Any gap in coverage would surely result in denials of coverage and/or exorbitant premiums on the part of most insurance companies. Is my daughter less deserving of affordable health care throughout her life because she met Cancer before her fourth birthday?The saddest part in all of this is that many of these cases seem to boil down to insurance companies denying health care coverage for seemingly arbitrary reasons. I see no reason why the insurance company could not pay MCV just as easily as Duke for any stem cell transplant services provided to our daughter. There is no good reason for uprooting a family and disrupting a treatment plan simply because of insurance company decisions. As a friend said to us, “"If our insurance industry would stop spending a large fraction of our premiums figuring out how not to provide coverage, we'd not have these problems. "Last week, I received a treasured gift from a close friend: a necklace with a small circle pendant that has the word “BELIEVE” etched into the circle. It carries so much meaning for me right now. I BELIEVE that the physicians and health care workers will use their expertise to provide the best care for my daughter. I BELIEVE in God and the power of prayer and I know that belief will help us get through this crisis in our lives. I BELIEVE that my daughter will find the strength and the will to see through to the other side of cancer. Finally, I BELIEVE that our government will work to create sound and equitable health care policies that will allow American citizens of all ages, economic levels, and abilities to receive the very best care available to them without fear of bankruptcy, future denial of coverage, or lack of choice in how they receive that care. As you move forward with President Obama and your fellow legislators, please think of my daughter’s story. Please share our story with your fellow Senators and other policymakers. It is my hope that stories such as ours will be the foundation for lasting, positive change for the citizens of our nation.